Creating Myself. One Story at A Time. 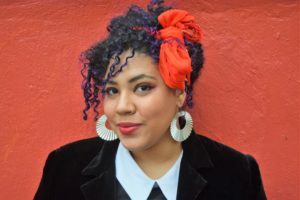 I’m a New Jersey-born badass activist, artist, educator, designer, writer, and games scholar who looks at play as a means of liberation for people of marginalized identities. My work often involves the themes of intersectionality, storytelling, and autoethnography as a means to create more inclusive futures and explore a more diverse past. Recently I graduated with honors from NYU’s Gallatin Gradate School, where I studied larp (live action roleplaying) as a tool for marginalized identities to deconstruct themselves. My expertise lay in the concepts of emancipatory bleed and liberatory narrative strategy as a way for marginalized individuals to achieve liberation through larping and reflection. In short? I write and investigate games and storytelling and teach others how to do the same. When I’m not running around the globe trying to learn about and document larps, I can be found writing larps, rpgs, short stories, plays and generally making a fuss. I’ve been playing pretend since birth and doesn’t intend on giving it up anytime soon. You can listen to some of my many speaking engagements here. Like my work? You can enable my participation in conventions, help me finish my games, and attend larps here.